We describe the design of a communications board that supports collective communications operations of parallel programs. Each cluster of processors are interconnected by a bus and connected to the communications board. The communications boards are, in turn, connected to a low latency, high bandwidth, slow configuration time crossbar network. The design is geared towards low-end (inexpensive) parallel computer architectures. 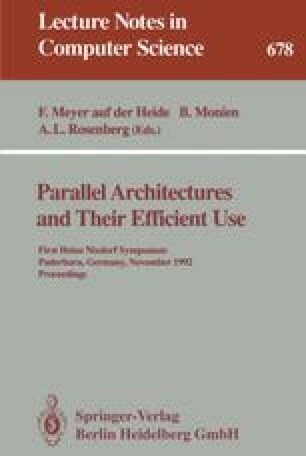 Such an architecture is motivated by recent advances in parallel programming models and in particular by the “loosely synchronous” style of parallel programming. Subgroups of processors alternatively perform local work with collective communication operations. This allows time to reconfigure the large crossbar and enables communication between processors without interrupts. The important broadcast, scatter, gather, and transpose operations can be efficiently supported.